For a limited time, American Airlines is giving away — for free, no strings attached — a pass to their Admirals Club business class lounge to anyone who is influential on Twitter. How do they know who on Twitter is influential? who might ask. For that, American Airlines partnered Klout. Klout is a website that uses a complicated, semi-secrete (and, in our opinion, semi-accurate) formula to score every Tweeter’s influence from 1 to 100. The scale is logarithmic, meaning it is easier to improve your score from 10 to 20 than it is to move from 20 to 30. The average Twitter account has a Klout score of 40. You need a Klout of 55 or over to score (pun!) your free Admirals Club day pass from American Airlines. And you have to go to aa.com/klout to sign up. And that’s it. You don’t even need to wait for your pass to arrive in the mail. You can print it out immediately or save it to your smartphone. Then bring the pass to any Admirals Club — there’s one in most major cities American serves, including Dallas, San Francisco, Los Angeles, New York, Tokyo and London — and you’ll be lounging on couches, surfing the web, eating high-carb snacks and drinking complimentary wine in no time. And here’s the best part: You don’t need to fly on American Airlines to use your Admiral Clubs pass. There’s not even a requirement that you send out a tweet about your lounge experience, though obviously American hopes that you will. If your Klout score isn’t high enough to make the grade there are several steps you can take to raise it. The single most important is to engage with your followers and to send tweets of the sorts that others will share. You can also give Klout to others (such as Spot Cool Stuff, by clicking here, hint, hint, hint) and encourage them to give a +K to you. 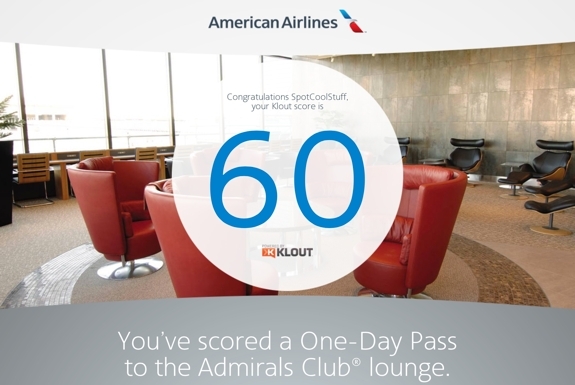 It’s worth raising your Klout even if you can’t get it above 55 by the time this American Airlines promotion ends. Sony, Samsung, Revlon and Red Bull are among the brands that have previously offered Perks to Tweeters of a certain Klout score. Others companies will surely follow. 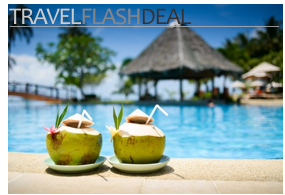 Is Fiji Airways the Next Cool Airline?